No, there’s no sign of a cover of The Cascades’ 1962 hit here; it’s all very much contemporary Americana. Amelia White’s style is very distinctive, and this is emphasised by the spontaneous feel of “Rhythm of the Rain”, which was made in four days at a very turbulent time in Amelia’s life. When she growls ‘Don’t think too much, people’ at the beginning of the title song, you can take a literal interpretation or a sarcastic one. Either works, it just depends wahich song you’re listening to. It’s certainly never going to be described a bundle of laughs, with “Yuma” and “Sugar Baby” dealing with addiction and “Sinking Sun” staring into depression. The musical stylings are pretty diverse, ranging from the adult-oriented-rock feel of “Sinking Sun” and “True or Not” to the laid-back Crazy Horse feel of “Supernova”. The album has a more raw, rockier edge than last year’s “Home Sweet Hotel”; although “Sugar Baby” opens with a menacing, ”Deliverance”-style banjo and eventually moves through the gears to “Sticky Fingers”-era Stones. Then there’s the title song, with a backbeat, swampy texture, and a sense of oppression and foreboding contrasted with the folky string band styling of the album’s closer which is enhanced by some nice Hammond organ. There’s one song that stands out, even on an album packed with powerful songs and performances, and it’s a co-write with Lorne Entress and Lori McKenna. The skittering rhythms of “Said It Like a King” make the song feel like it’s rushing uncontrollably towards an unpleasant revelation; I may be looking for examples of this everywhere at the moment, but this song does sound like it might have been partly inspired by the leader of the free world. It’s about bullying and pulls together vignettes featuring a bully on the school bus, a hellfire preacher and a general delivering unpalatable messages which are accepted because each one “Said it like a king”. It’s a very clever lyrical idea, but the kicker comes in the final verse. No spoilers, you have to listen for yourself. “Rhythm of the Rain” is an intense experience; even the opening song “Little Cloud Over Little Rock”, peeping into the lives of smalltown Americans having their Friday night fling to a soundtrack of Merle Haggard and George Jones is underpinned by the quiet desperation of the line ‘his friends are coming to drink their unemployment down.’ Is the album downbeat? Yep. Fraught? Sure. Compelling? Utterly. “Rhythm of the Rain” is released in the UK on White-Wolf Records on Friday October 27th. Amelia will be touring the UK in November. Check out the dates here. 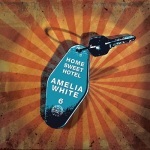 Amelia White is from East Nashville. As Sam Lewis explained recently at Green Note, the distinction between downtown Nashville and East Nashville is one that means less and less the further you get away from Nashville, but it’s an important one. Downtown is the centre of the country establishment and East Nashville’s the edgy, hip satellite where you’re likely to hear something a bit out of the ordinary and “Home Sweet Hotel” certainly isn’t what you would call mainstream country. There’s a bit of a harder rock edge to most of the songs with a bit of overdriven guitar and some nice double lead guitar arrangements to spice the mix up. The opening song “Dangerous Angel” is the first clue that this is a long way from mainstream country; there’s a slight emphasis on the offbeat which isn’t quite reggae, but it’s certainly leaning in that direction. From here on the album moves through a variety of musical stylings, including the uptempo country rock of “Leaving in my Blood” through the early Dylan feel of “Dogs Bark” to the slow sixties feel of “Right Back to my Arms” and “Six Feet Down” which close the album. The lyrical theme running through the album is the performer moving along from town to town and it’s one that’s fairly common in current Americana. There’s no romance to being on the road, it’s just a succession of cheap motels and long drives and Amelia highlights this, and the longing to be back among family and friends (and with a lover). Her lyrical style is succinct; songs that seem to be densely packed with lyrics when you hear them turn out to be just a few lines long when you see them on the page. “Dogs Bark”, a warning against shooting your mouth off is a great example; it rattles along like some early multi-versed Dylan epic, but it’s really just a few very well-written lines (and some advice that Elvis Costello should have taken a long time ago). Amelia sees herself as a songwriter first and performer second, and the craft in the construction of the songs is evident; there isn’t a word wasted and the lyrics are matched by the musical settings. And the East Nashville thing isn’t just about living there; Amelia creates a sense of place with references in “Rainbow over the Eastside” and the line ‘Hanging at The Family Wash’ from “Melissa”. It’s not just a place, it’s a way of life. 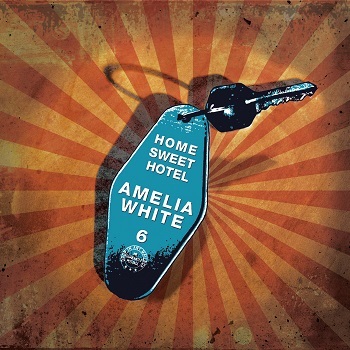 “Home Sweet Hotel” is out now on White-Wolf Records.